Is this a 10cc reunion? Well, sort of.... Former band member and legendary director Kevin Godley has created 2 new videos for Graham Gouldman's touring version of 10cc. This is not the first time the two founding band members have collaborated. Godley and Gouldman created some fascinating new music back in 2006 under the guise GG/06, in which the track used for one of the videos "Son of Man" was created. In 2006, for the first time in over three decades original 10cc members Godley and Gouldman reunited to record new music. Best known for such classic 10cc hits as "Rubber Bullets," "I'm Not In Love" and "The Dean & I," as well as Godley and Creme's hit "Cry," Godley and Gouldman recorded six new download-only songs which received rave reviews from fans and critics alike worldwide! 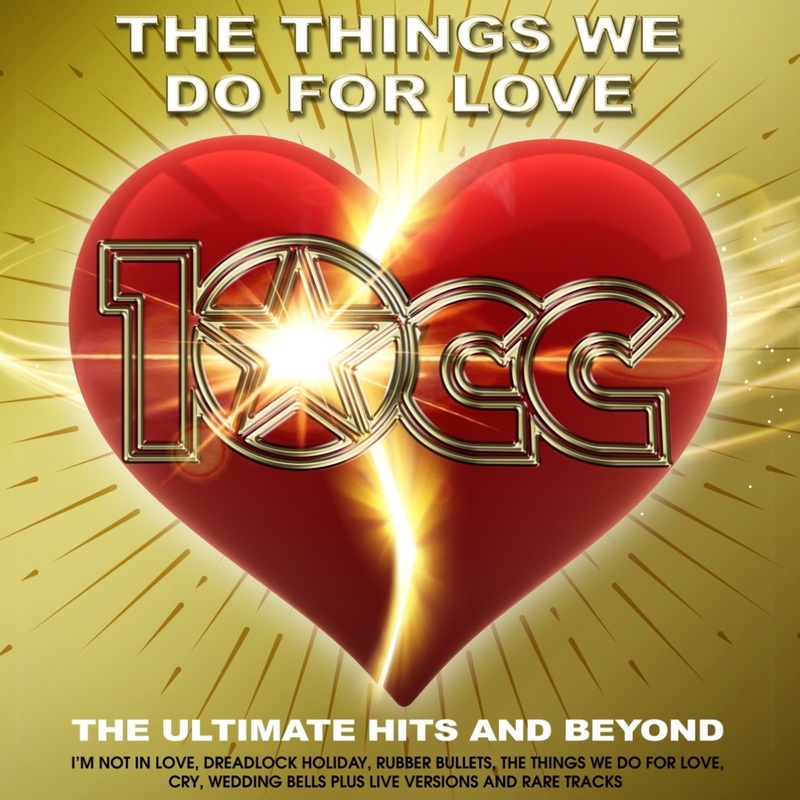 The music has recently been released on a limited edition CD only available at 10cc shows! Says Kevin, "I made this film of the GG/06 (that's me and Graham Gouldman) track 'Son Of Man' for the current 10cc touring band. 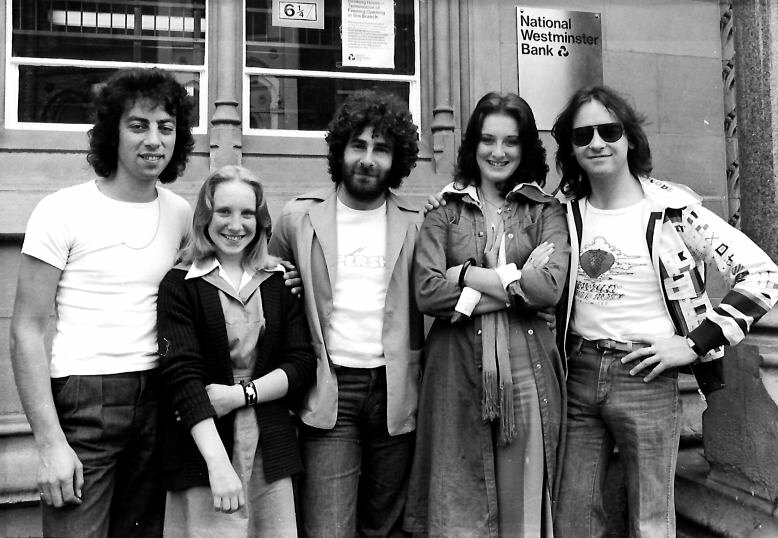 It's a musical documentary about how 10cc started so it works as a kind of intro to the show. I ripped lots of stuff, shot everything on my iPhone X off my desktop screen, generated text, became a throwback using the MSQRD app and edited it all on Adobe Premier Pro. Tech head." Watch the video for "Son Of Man"
Record Collector magazine described "Son Of Man" as "a tongue-in-cheek account of how a trio of studio-bound hermits called Hotlegs became the 70s chart-topping quartet known to all as 10cc. The song that was neither music nor art was Hotlegs' 1970 one-hit oddity, 'Neanderthal Man,' while 'Graham on bass' was none other than Graham Gouldman. And so, the 10cc story has come full circle." Kevin created a second video for 10cc's mega-hit "I'm Not In Love." Kevin explains, "I directed and edited this film to visually enhance the current 10cc touring band's live performance of 'I'm Not In Love' and it was a 100% labour of love." Watch the video for "I'm Not In Love"
"I'm Not In Love" was written by band members Eric Stewart and Graham Gouldman and is known for its innovative and distinctive backing track, composed mostly of the band's multitracked vocals. Released in the UK in May 1975 as the second single from the band's third album "The Original Soundtrack," it became the second of the group's three number-one singles in the UK between 1973 and 1978, topping the UK singles chart for two weeks. The song was also the band's breakthrough hit worldwide, reaching number one in Ireland and Canada and number two on the Billboard Hot 100 in the US, as well as reaching the top 10 in Australia, New Zealand and several European countries. "I'm Not In Love" was originally conceived as a bossa nova song played on guitars, but Kevin Godley and Lol Creme disliked the track and it was abandoned. However, after hearing members of their staff continue to sing the melody around their studio, Stewart persuaded the group to give the song another chance, to which Godley replied that for the song to work it needed to be radically changed, and suggested that the band should try and create a new version using just voices. Along with the 2 new videos, Kevin Godley created and starred in a previous innovative video for the song "Somewhere In Hollywood" which 10cc have used in concert during the past couple of years. Watch the video for "Somewhere In Hollywood"
In other news, Kevin Godley recently started recording his highly anticipated new solo album "MUSCLE MEMORY." What makes this album special, along with being his very first solo album, is that it will be comprised of collaborations between Kevin and a cast of musicians he has only met via email or Skype, who have submitted instrumental tracks that he has chosen to turn into songs. Kevin is also in the early stages of pre-production to direct his first feature film, "The Gate," based on Orson Welles' adventures in Ireland circa 1931. “Flowers At The Scene” album by Tim Bowness. Representing the duo of Tim Bowness and Steven Wilson's first joint production in over a decade, the album features stunning performances from an extraordinary cast of players including Peter Hammill (Van Der Graaf Generator), Andy Partridge (XTC), Kevin Godley (10cc), Colin Edwin (Porcupine Tree), Jim Matheos (Fates Warning/OSI), David Longdon (Big Big Train), co-producer Brian Hulse (Plenty), Australian trumpeter Ian Dixon, and drummers Tom Atherton and Dylan Howe (Wilko Johnson). The album features a backing vocal appearance from Kevin Godley (on the song What Lies Here). It will be available as a CD in deluxe digipak, 180g black vinyl in gatefold cover with insert and CD and a 180g red vinyl edition in gatefold cover with insert and CD. Released on 1st March, all pre-orders from Tim's store - https://burningshed.com/store/timbowness - come with an exclusive signed greeting card and an exclusive free mp3 EP that includes a Kevin Godley lead vocal version of What Lies Here. The album will also be available from Amazon, Spotify etc etc. Vic Emerson, who has died aged 69 of pancreatic cancer, was a keyboard player with Mandalaband, Sad Café and 10cc. He co-wrote the single Every Day Hurts, which was a huge hit for Sad Café in 1979. He was born in Prestwich near Manchester, the son of Ben Emerson, a tailor, and his wife, Myra. Vic was always a talented musician; he had his first piano lessons at four and passed his grade six exam at the age of 12, while at Bury grammar school. In the early 1960s he bought a Hammond organ to play at home, and when he left school he became a cinema organist in Stockport. By 1976 Mandalaband had broken up. Vic moved into a flat in Manchester with Stimpson, and they were looking to form a new band. “We needed a singer. John told me there was a friend of his playing at Manchester Polytechnic students’ union. There were two acts on. The first act didn’t happen. The next singer sang two lines. That guy had it. The band was Gyro. The singer was Paul Young. We offered Paul a deal.” It was the birth of Sad Café. According to Vic, the story behind Every Day Hurts is that, “The music was mostly mine. The melody on the verse is Paul Young’s. The sad truth of Every Day Hurts was I wrote it at my house in Blackpool when my dad was dying, although the lyrics are Paul’s.” The song was also co-written by Stimpson. It reached No 3 in the UK charts. In the early 80s Vic toured with 10cc and played on their albums Ten Out of 10 and Windows in the Jungle. He stayed with Sad Café until 1984. The following year he went to Paris to do some sessions and a tour, and decided to stay. He lived and worked there for 33 years. 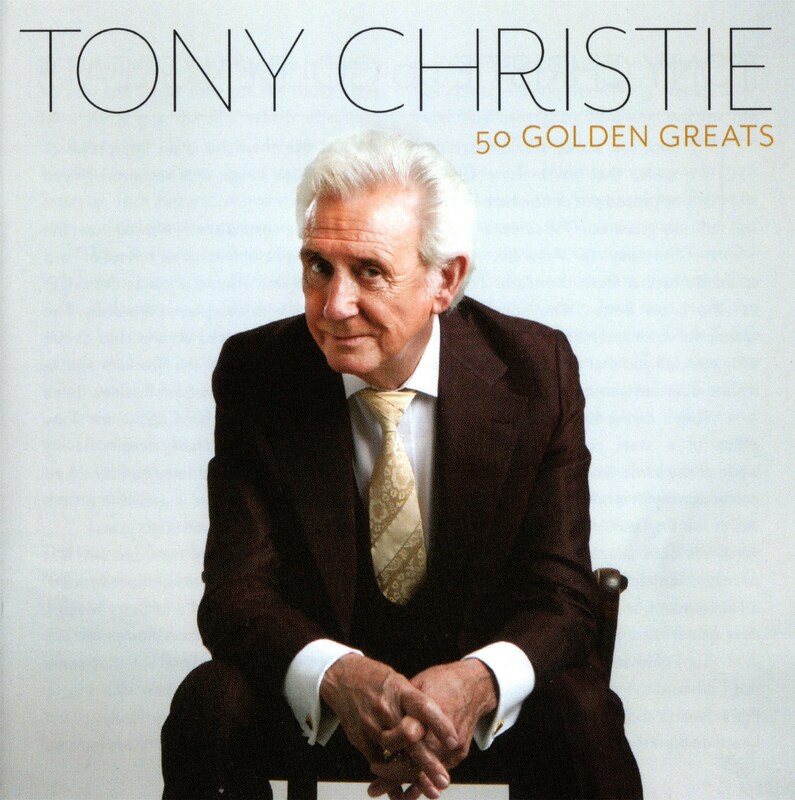 After Young died aged 53 in 2000, Vic contributed a handful of tracks for a posthumous Paul Young album, Chronicles, which was released in 2011. 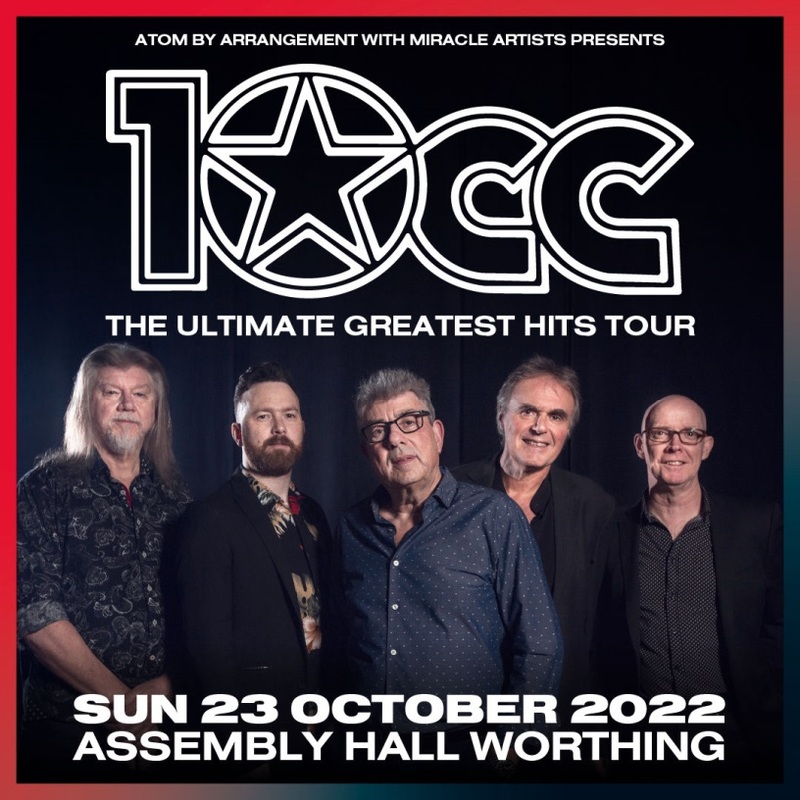 Graham Gouldman will be taking his touring 10cc on the road in 2019. March will be a busy month as he goes to Scotland, Wales and England. The dates have just been added to our dates page. There are also three dates for the end of April & early May. Graham Gouldman is currently touring Eurpoe with Ringo Starr & His All-Star Band. In September Ringo is taking his tour to America, staring off in Tulsa, Oklahoma and finishing up in Los Angeles, California. Tour details, as ever, on the dates page. Graham Gouldman will be taking his Heart Full Of Songs tour abroad in 2019. A week of concerts next February will take place in the Netherlands. They’ve been added to our dates page, as well as ticket links. We have been sent a video trailer in mp4 format of Kevin Godley for Liam Newton’s updated book 10cc: The Worst Band In The World. Click on the link to download and watch. “Joerg here, from national public radio SWR1, Germany. Just wanted to inform you about an on-demand-concert video, that we will air this Monday, April 2nd: "10cc live at SWR1 Musik Klub unterwegs"
It's a concert, that 10CC did with us for our show "SWR1 Musik Klub unterwegs" at Capitol Mannheim - almost 90 minutes really worth watching, the audience was amazed. You are welcome to share the link on your website or share the facebook post on Monday, once it is online. We have been advised that the website address for Graham’s touring 10cc has been changed… it used to be 10ccworld.com but it has now become 10cc.world Click on the link and it will take you there. We are in the process of going through all the web-links we have and we will publish an updated page in the near future. We have been informed by the author, Liam Newton, that his 10cc biography has been fully revised and updated and includes a new foreword by Kevin Godley. You can obtain an ‘earlybird discount’ by registering asap at 10ccbook.com. Just are the dates for Ringo Starr’s summer tour which Graham Gouldman is guesting on. We also bring you the dates for Graham’s touring 10cc’s UK tour this coming October and November. An original Ivor Novello award honouring one of the best pop songs ever made - I’m Not In Love by 10cc – is expected to spark a worldwide bidding battle. The ground-breaking song, number one in the UK singles charts for two weeks in 1975, won the band worldwide acclaim and three Ivor Novello awards for Best Pop Song, International Hit of the Year and Most Performed British Work. It reached number one in Ireland and Canada, number two in the US and made the top 10 in Australia, New Zealand and several European countries. Now 10cc fans have a chance to call the award for Most Performed British Work their own when it comes up for auction at Hansons Auctioneers on March 14 with an estimate of £1,500-£2,000. It belongs to 10cc’s former co-manager Ric Dixon – a man who played a part in bringing the musical geniuses together. 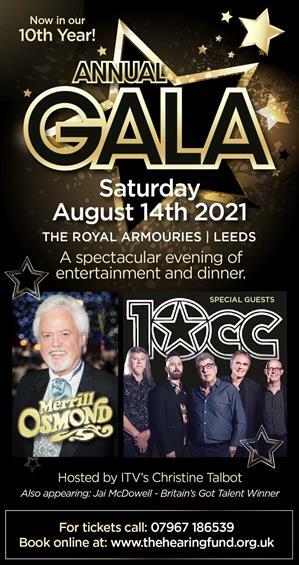 It will be sold alongside a gold disc presented to him to recognise sales of more than 100,000 copies of 10cc’s Greatest Hits 1972-1978, estimate £200-£300. The exhibition at Stockport Museum celebrating the legendary Stockport recording studios known as Strawberry has been granted an extension and an update. It will be open until September 30th 2018. Admission is free. The exhibition explores Strawberry’s musical heritage and how 50 years on, the Studios still remain preserved in history. We’ve just been sent the Australia 2018 tour dates. You can find them on our dates page, along with an extra German concert date. Back in August we told you about Kevin’s bold plans for a “solo” album. Well, we can bring you a brand new track from this endeavor called “All Bones Are White” Click on this link to head to the demo mix and artist interview. Ringo has kept the same band line-up for several years, but wanted a change for the next tour and approached Graham with the idea some months ago. The All Starr Band also features Steve Lukather of Toto, Gregg Rolie of Santana, Men At Work’s Colin Hay, Warren Ham (whose credits include working with Toto, Donna Summer and Olivia Newton-John) and Gregg Bissonette (Santana, Toto and ELO). 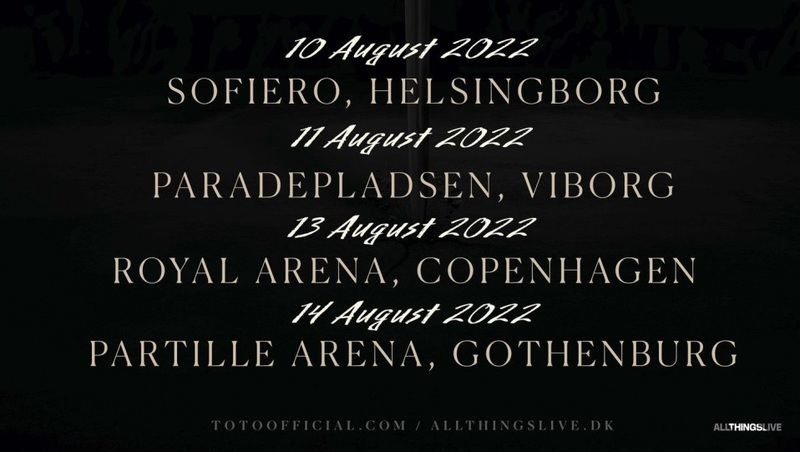 The 21-date tour will take the band to Austria, Belgium, Czech Republic, Denmark, Finland, Germany, Luxembourg, Monaco, Netherlands, Israel and Italy. Click on the link for more details. 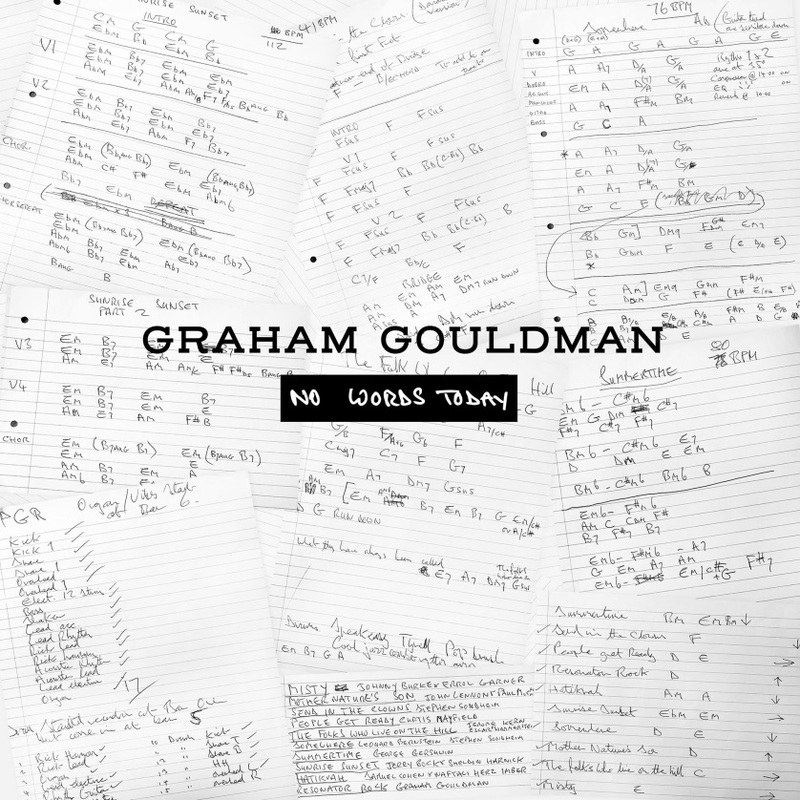 In September a 6-track EP was available at concerts on Graham’s Heart Full Of Songs tour … click the cover for details. March 2018 sees Graham and his touring 10cc play four dates in Germany followed by 8 dates in the Netherlands. See the dates page for details. Last month we posted a link to Jason Barnard’s blog which featured an interview with Eric Stewart. We can now bring you the second and final part. Fans will be able to purchase a specially recorded 6 song EP this September at concerts on Graham’s Heart Full Of Songs tour. As yet, details are not available for track listing and price. The list of concerts can be seen on the dates page. Follow this link to preorder exclusive signed artwork, prints and posters in addition to the two superb 10cc & Godley and Creme Box Sets. This box features music from Kevin Godley and Lol Creme that spans 10 years. The first CD combines 1977’s L and its follow-up Freeze Frame. The next album, 1981’s Ismism (aka Snack Attack) shares space with 1983’s Bird Of Prey on another ‘two-fer’ disc (although a close look at the track listing confirms that the last song on that album – Out In The Cold – is bumped to the start of CD3!). 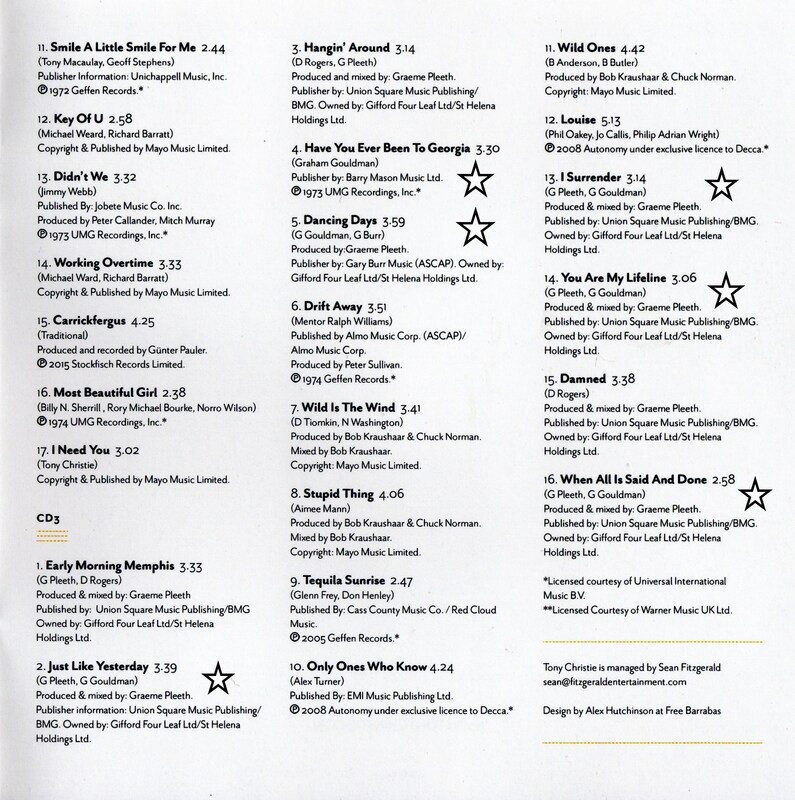 The History Mix Volume 1 (which features the hit single Cry) and their final album Goodbye Blue Sky fill out the next two CDs and the final disc contains single A-sides, B-sides and an extended version. Click here for track details. The other two discs are ‘And Friends‘ which features collaborations and production work (if you bought Strawberry Bubblegum a few years ago, you have this disc) , while the final CD ‘Before 10cc – The Early Years‘ which has work from early beat group The Mindbenders which featured Eric Stewart and Graham Gouldman and Hotlegs which was an early incarnation of 10cc. The Eric Stewart Anthology double CD will be released by Cherry Red Records on July 21st. This September sees Graham Gouldman embark on a 22 date tour of England, Scotland and Wales with his Heart Full Of Songs tour. The complete list can be seen on the dates page. Wikipedia says “Emily Barker (born 2 December 1980) is an Australian singer-songwriter, musician and composer. Her music has featured as the theme to award winning BBC dramas Wallander and The Shadow Line. With multi-instrumental trio The Red Clay Halo, she has recorded four albums: Photos.Fires.Fables. (2006), Despite The Snow (2008), Almanac (2011), and Dear River (2013), whilst releasing a solo album The Toerag Sessions (2015). Other projects include Vena Portae (with Dom Coyote and Ruben Engzell) and Applewood Road (with Amy Speace and Amber Rubarth). Her latest album is called “Sweet Kind of Blue” and features a track called “Tomorrow Be Now” which she co-wrote with Graham Gouldman. The album was released on May 19th 2017. 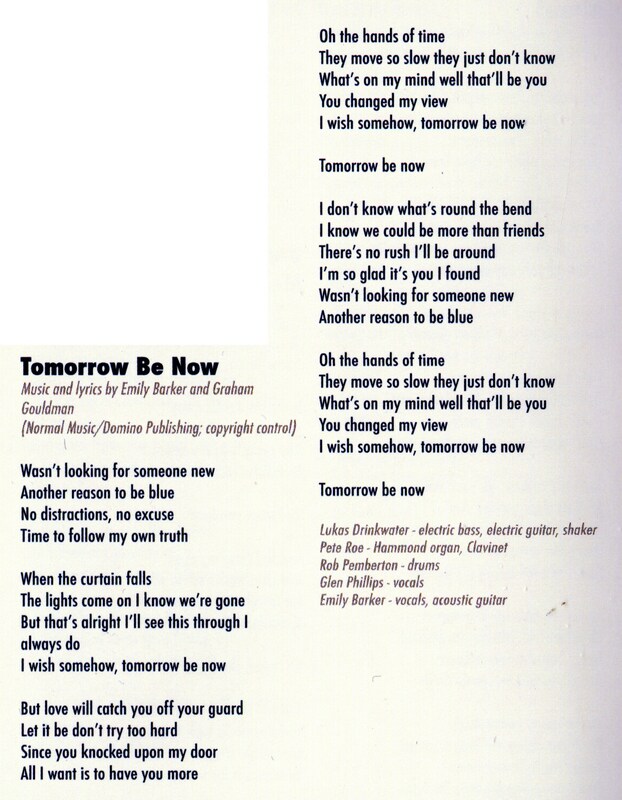 Click on photo’s of CD & Lyrics to enlarge them. The organisers of the Gig For Life festival, due to take place on May 27th, have announced that they had to make the difficult decision to postpone the event due to unforeseen circumstances, but with a view to running it in 2018 instead. Apologies to all that entered our competition to win tickets. Graham’s 10cc will be appearing on “Later… With Jools Holland” on Tuesday May 9th. The ½ hour show will be broadcast on BBC2 at 10pm BST. They’ll be performing one of three songs on the Tuesday night show… The Wall Street Shuffle, Art For Art’s Sake and I’m Not In Love. However they’ll perform all three in the longer airing of the show at 11.05pm 12th May. After a few months of touring, there’s nothing Graham likes more than to go along to Davids Music Store in Letchworth, Herts, and hold a 45 minute singing and signing set. And that’s just what he did on April 22nd. A big thank you to Andy Oaten, the manager at Davids Music Store, for the photo’s and CD details. Welcome to Tom Kerridge presents Pub in the Park, 19-21 May, Marlow, Bucks, England. Tickets are for Sunday evening’s session: 6pm – 10:30pm. Expect Sunday evening to be full of the very best food, drink and music. Ten of the UK’s top pubs and restaurants will be serving tasting dishes for you to purchase whilst some of the best chefs & guests in Britain will be joining Tom over the weekend to share their tips and tricks of the trade through demos and masterclasses. After you’ve spent the day grazing on a selection of delicious food and drink, then kick back in front of the live stage and listen to headliners 10cc, Fun Lovin’ Criminals and The Rifles! In other Eric related news, Cherry Red are currently planning a summer release for the (also long-awaited) Eric Stewart compilation CD which will, we are informed, feature some tracks from Frooty Rooties which have never been officially released on CD before. Stay tuned for more details as and when. This information was announced on Eric’s website today. The organisers of “Gig For Life” have kindly donated a pair of tickets to the10ccfanclub.com for the 10cc concert on May 27th (see below for concert details) for which we shall hold a draw. To enter the draw for the tickets, just send us your name and address in an email to competition@the10ccfanclub.com. Once the winners have been selected, the festival organisers will be informed so they can sort out the tickets for you. One entry per person please. The winner’s name will be announced on this website. No correspondence will be entered into. Names and email addresses will not be passed on to anyone else. Closing date for the competition is Saturday May 13th. On Saturday May 27th, there will be a NEW music festival called Gig For Life. It is being held at the Hop Farm, Paddock Wood, Kent and 10cc will be the headline act. The website is https://www.gigforlife.co.uk and the festival is raising money in aid of Cancer Research UK. A very rare cassette tape found its way into our archives recently… as you can see, it contains three rough (but genuine) mixes of Wonderland, Woman In Love and Stars Didn’t Show. 4th January 2017 on BBC Radio 2… New Series featuring Suzi Quatro with favourtite singers/songwriters. She starts with Graham Gouldman, responsible for mid-1960s pop gems for the Yardbirds (For Your Love, heart Full Of Soul, Evil Hearted You), the Hollies (Look Through Any Window, Bus Stop) and Herman’s Hermits (No Milk Today, East West). BBC iPlayer should carry the show for a while if you miss it “live”. 27th January 2017 until 29th January 2018… There will be a unique exhibition at Stockport Museum celebrating the legendary Stockport recording studios known as Strawberry. Admission is free. The exhibition explores Strawberry’s musical heritage and how 50 years on, the Studios still remain preserved in history. 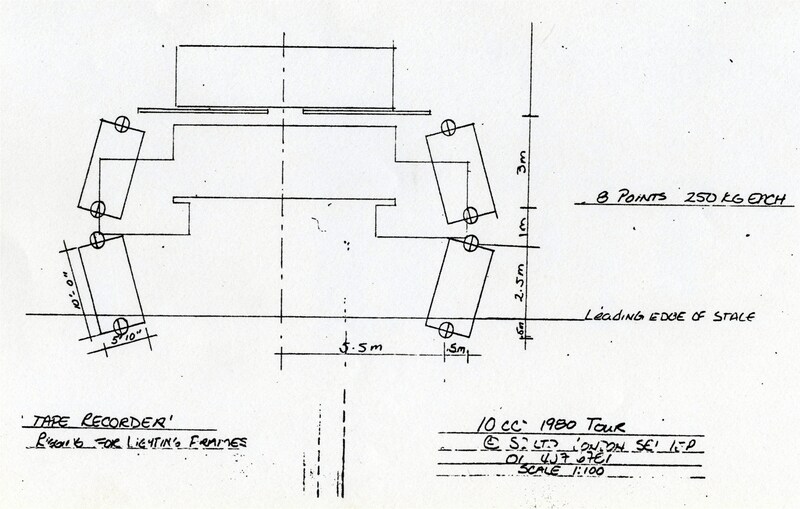 Nigel Gray, engineer, producer (born in 1947), died in Cornwall on 30th July. Best known for his work as a producer with The Police and Godley & Creme, among others, he won a Grammy for The Police’s Zenyatta Mondatta and the tracks Don’t Stand So Close To Me and Behind My Camel. A qualified medical doctor, he converted a village hall in Leatherhead, Surrey, into the four-track Surrey Sound Studios in 1974, upgrading it to 16-track in 1977 and 24-track in 1979. The Police recorded their first three albums there, while The Lotus Eaters, Latin Quarter and Siouxsie & The Banshees cut hits there, and Godley & Creme laid down five albums. Gray’s extensive work as both engineer and producer includes sets by Wishbone Ash, Tank, The Professionals, Girlschool and Hazel O’Connor. He sold the studio in 1987 and retired. Tickets for the newly announced (Tuesday 25th) 10cc major cities tour next March-April are available exclusively to 10cc fanclub folk on Wednesday (26th) via the live band's website www.10ccworld.com. The 2017 UK tour dates have been announced. They can be seen on the dates page. We’re able to offer some free tickets to see 10cc at the Greenwich Music Time Festival for free, if you’re interested in sending competition details out on your news page. PLEASE NOTE : This competition is NOT being run by the Fan Club. We’re not a political website. We just bring you the 10cc-related news. It seems Trevor Horn and Lol Creme have come up with a new song… here’s the link. “The Referendum Game” was produced by Trevor Horn and ex 10 CC star Lol Creme helped write the music. Vocals are by Art Wellesley. Sunday 18th June sees the third day/night of Rock On Windermere and 10cc are the headline act that night. Just thought I would send you a quick email about Westside Proms. Westside Proms is set to be the first concert in the new Tropicana. The venue made world famous by Bankys Dismaland. The venue has seen a transformation since the close of Dismaland and now the first show to take place is Westside Proms. 10cc headline on Saturday 18th June Tickets a fantasic £25.00. The concerts will also be taking place over the weekend of Weston Air show so the band will be a great finish to a fantastic day of airplane displays including the Red Arrows. Hope you might join us. 10cc are headlining Sat 4 June at the Wychwood Festival in Cheltenham. Click on the link for more details and a link to the Festival’s ticket page. An original Ivor Novello award for the 1975 10cc single I’m Not In Love that was presented to the music publisher St. Annes Music for Best International Hit Of The Year. The award ceremony took place at the Dorchester Hotel, London in January 1976. 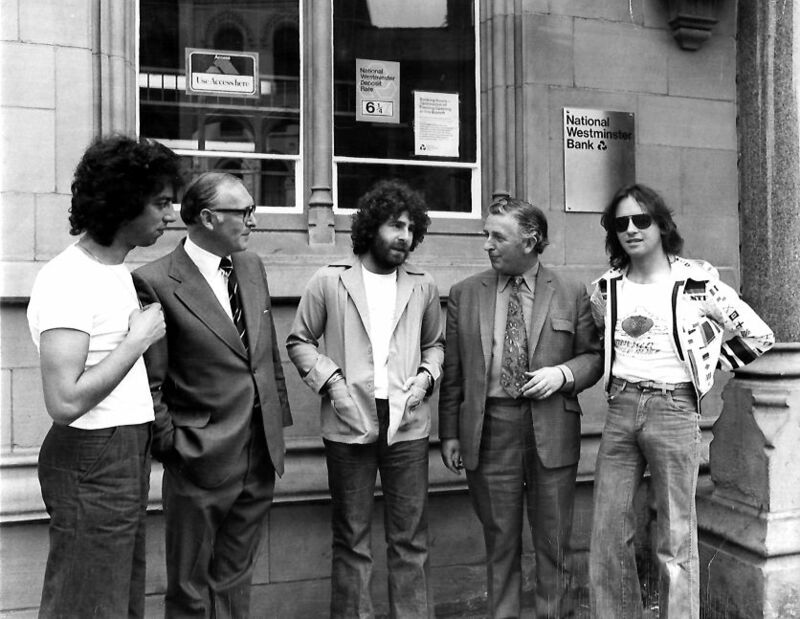 10cc were awarded three Ivor Novello awards in the categories of Most Performed Song Of The Year, Best Pop Song and International Hit Of The Year. The statue and plinth stand 30cm (11.75 inches) tall. The condition of the award is very good plus. An original UK BPI sales award presented to Ric Dixon to commemorate the sale in the United Kingdom or more than £250,000 worth of the 10cc 1975 Mercury Records LP The Original Soundtrack. The award consists of a gold disc mounted with a BPI sales plaque and a small square featuring the album cover artwork on the original red matte background in a gold coloured metal frame. The frame measures 41cm x 51cm x 2cm (16 inches x 20 inches x 0.75 inches). There is some light scratching to the frame. The condition of the award is very good. An original Australian Phonogram PTY Limited sales award presented to 10cc to commemorate Australian Sales of more than 20,000 of the 1977 LP Deceptive Bends. The award consists of a gold disc mounted with a Phonogram PTY Limited sales plaque on a black matte background in a gold coloured frame. The frame measures 50.5cm x 60cm x 3.5cm (20 inches x 23.5 inches x 1.25 inches). The condition of the award is very good minus. An original Record Of The Year Award for 1977 presented to Mercury Records for the 10cc LP Deceptive Bends from the USA magazine entitled Stereo Review. The award consists of a silver framed plaque with a black background and white printed writing. The award measures 25.5cm x 20.5cm (10 inches x 8 inches). The condition of the award is very good minus. 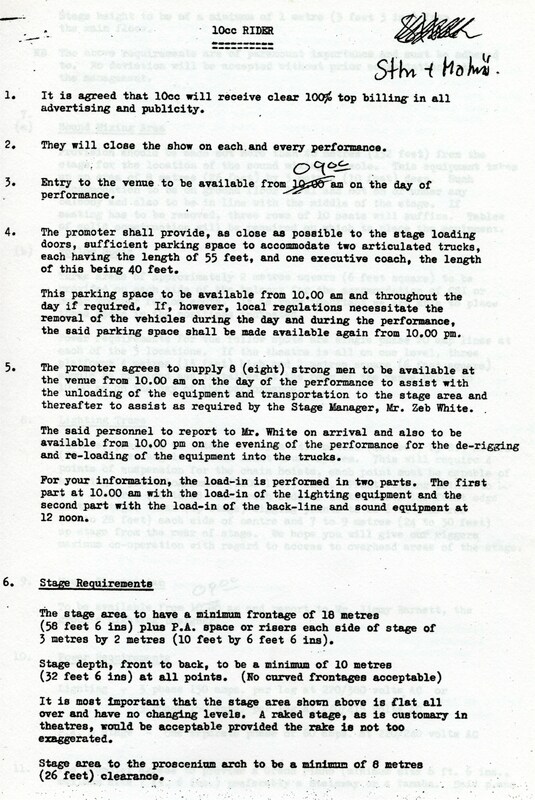 A 1977 10cc Deceptive Bends tour programme that has been signed on the cover by all six group members. Eric Stewart, Graham Gouldman, Tony O Malley, Rick Fenn, Stuart Tosh and Paul Burgess have each signed their full names in a black ballpoint pen. The programme measures 21cm x 30cm (8.25 inches x 11.75 inches). The condition of the programme is very good plus. Also included in the lot are a collection of items relating to 10cc. The items are as follows: a Dutch Edison Awards programme, an Australian Tour ‘77 sticker, a Mercury Records merchandising poster, a Japanese 1977 Rockupation press kit, a UK press kit and 2 Japanese Rockupation tour programmes. 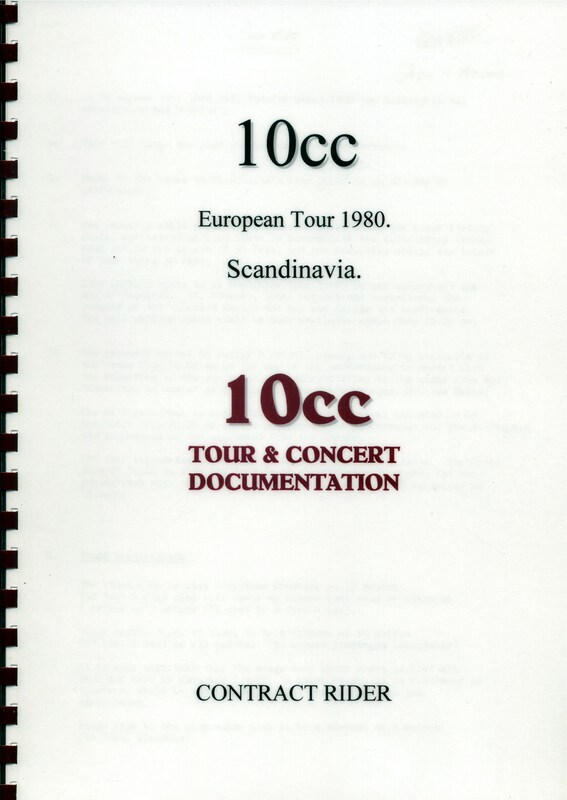 A white 10cc 1980 European Tour jacket of the type that would have been issued to the personnel and crew on the tour. The jacket has the 10cc logo with the text ‘Euro Tour 80’ on the front right side. It was manufactured by Avon Sportswear, Toronto, Canada. Size medium. The condition of the jacket is excellent. These items are from the collection of the former 10cc co-manager Ric Dixon. Ric began his career as a musician. He went on to be the owner of The Oasis Club in Manchester and later managed The Mindbenders. However Ric is best remembered for his successful management of 10cc during the peak years of the band. He was also instrumental in bringing over Abba to the UK for their 1979 tour. Ric was an associate at Kennedy Street Enterprises, Manchester and subsequently became heavily involved with the creation of Strawberry Studios in Stockport. Bidding starts tomorrow, March 24th and concludes with a live online event on 3rd April. 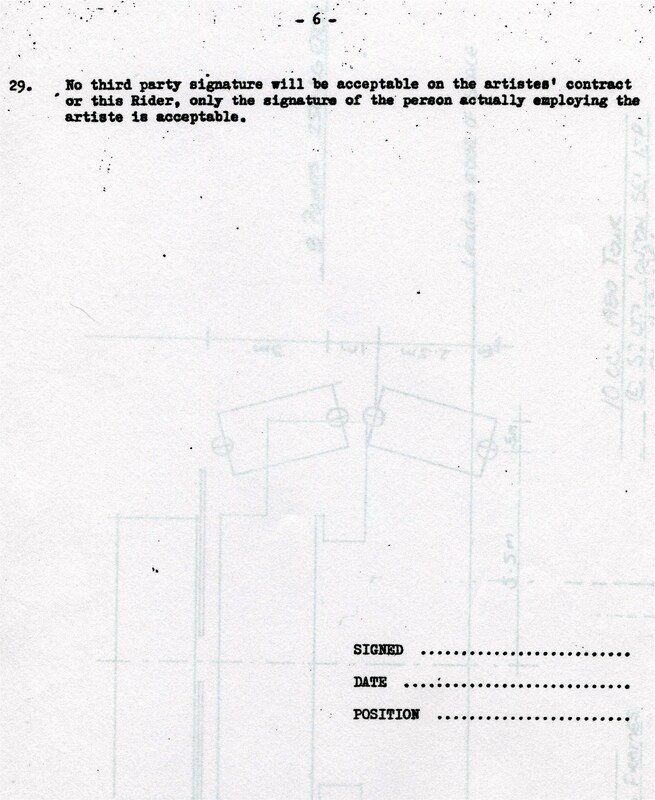 Here is a unique oportunity to own a piece of music history, the orginal name plaque of the ledgendary strawberry recording studios in stockport, at the time it was the abbey road of the north and the home of 10cc biggest hits, including "im not in love"
By the way, this auction closed out with just one bid for the starting price of £500.00. 10cc will be appearing at the Greenwich Music Time festival at the Old Royal Naval College, London on Saturday 9th July 2016. 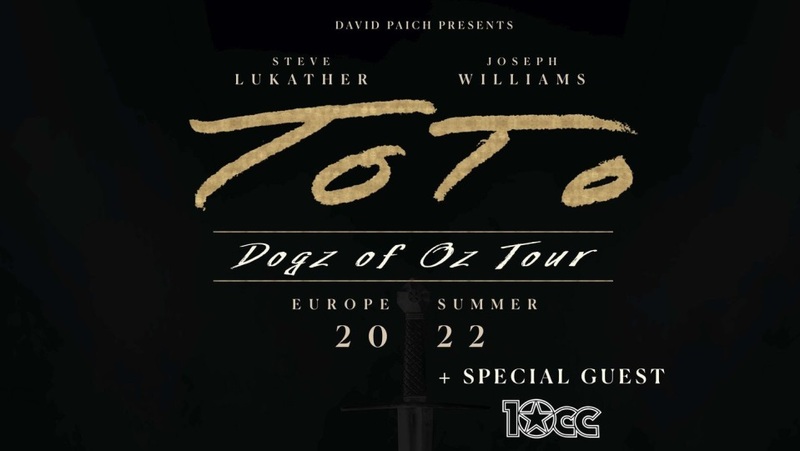 There is a special pre-sale ticket link for 10cc fans shown below. The 2017 tour dates are announced today. They can be seen on the dates page. Tickets go on sale in early February. Graham’s touring 10cc will be performing in the Royal Hall at the Villa Marina on the Isle of Man this coming April. For full details click on the link here. We received an email from an Australian lady by the name of Virginia Munro. She gave us a link to a podcast which features an interview with Eric. Virginia says “Anyway, Eric gave a lovely interview with a Melbourne radio station in 2013. He comes across as very approachable, likeable, down to earth and he loves Australia! I also love what he wrote about friendship on Do Not Bend. I’m with him there - you don’t turn your back on your friends when they need you. It’s an honour that they trust you enough to open up.” So here’s the link. HAPPY BIRTHDAY from all at the fan club website on behalf of all your fans around the globe. 71 today, 71 today. He’s got the key of the door, never been seventy one before. What's music legend KEVIN GODLEY (10cc / Godley & Creme) doing now? HOG FEVER the Ear Movie, that's what. "Hi to all the 10cc and Graham Gouldman fans. My film has just been released on the LP design work of Storm Thorgerson and Hipgnosis and as you know, Storm did loads of fantastic imagery for 10cc over the decades - probably the longest collaboration other than that with Pink Floyd. Graham appears in the film as well as Storm talking about many of the designs so please check out and also PLEASE SHARE links as distributing the film independently. Cheers and happiest of holidays, Roddy Bogawa"
Graham’s 10cc will be appearing at the 2016 “Concert At The Kings” on Saturday 21st May. 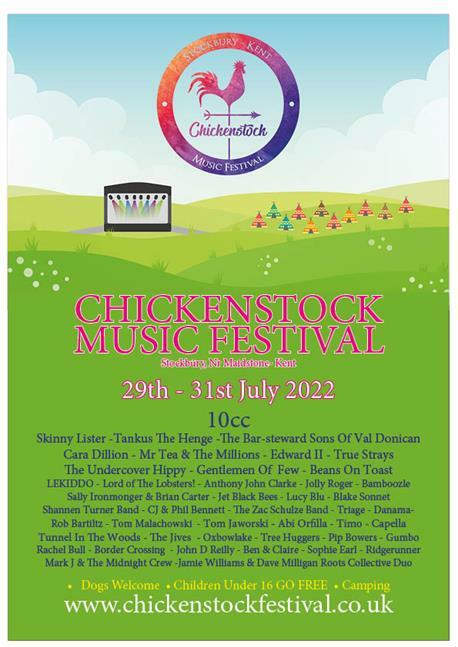 Details can be found at the website concertatthekings.co.uk Also appearing will be Suzi Quatro, Big Country and Marmalade. Headlining the concert will be the SAS Band. BBC Four, in the UK, will be broadcasting this show on Friday December 4th at 10pm GMT. In celebration of the 40th anniversary of smash hit I'm Not in Love, the original members of 10cc - Graham Gouldman, Eric Stewart, Kevin Godley and Lol Creme - reunite to tell their story. The documentary shares the secrets to some of their most successful records, from the writing and the recording to the tours and the tensions. With contributions from an impressive array of music industry legends including 10cc's band manager Harvey Lisberg, lyricist Sir Tim Rice, broadcaster Paul Gambaccini, legendary producer Trevor Horn, Stewart Copeland (the Police), Graham Nash (the Hollies) and Dan Gillespie Sells (the Feeling), not only does this film highlight the diversity of these four brilliant musicians' songwriting talent, but it also delves into the influence they had, as well as the politics beneath their acrimonious split in 1976, at the height of their fame. It should be available on the BBC iPlayer shortly after transmission. Graham Gouldman will be the guest with Aled Jones on BBC Radio Wales on Sunday October 11th at 1pm BST. Aside from his duties with the 10cc touring band, Mick Wilson has been busy with a new band… “Cats In Space” Their debut single is called Mr Heartache and you can read Dave’s review here. So, aside from his duties with the 10cc touring band, and the “Cats In Space” band, Mick Wilson has also been busy with another group… “W.A.L.E”. Their album “Come Together” features songs songs written and produced by Harry De Waij and Joos Van Leeuwen and Mick sings lead vocals on all but one of the tracks. You can read Dave’s review here. My name is Lisa Hafey, I'm the editor of essentiallypop.com. I've just done a phone interview with Kevin Godley, as a follow up to a piece we wrote about Spacecake. (click here to read that article) It's an hour long interview, and I'm currently transcribing it but it occurred to me that you guys might like to have the links to it. We're going to upload extracts of the interview to our youtube channel as well if we can, because the published interview isn't going to be everything that was covered in the interview, primarily because it's so jolly long :) Anyway, if you're interested, we'll send you the links when it's published. With the pending tour of New Zealand later this year, we thought we’d show you one way it’s being promoted. Click on the link to see. June 3rd sees the fourth anniversary of the untimely death of Andrew Gold, aged just 59. A previously unreleased live show has been released. Click here to read about it. Details on how to purchase it are here and also on Amazon. We’ve just received news of two dates for August. Buxton and Worthing on the 13th and 20th respectively. If we hear of any more, we will of course bring you details and dates. We’ve just uploaded the latest list of concert dates. Australia, New Zealand and Holland get tours in October, November and March. Ireland - SPACECAKE chronicles the misadventures of a debauched and dangerous masochist as he tantrums his way through the sleazy worlds of Rock & Roll, music video and technology, each squalid escapade dragging him ever deeper into a repugnant maelstrom of sordid excess...well sort of. A wee bit. Actually...not remotely. If you don’t recognize the name, Kevin Godley was a founder member of ground breaking UK band 10cc. (Their single, “I'm Not In Love” continues to be one of the best selling records of all time). As one half of Godley & Creme he went on to pioneer the notion of music video as an art form and was responsible for iconic clips by artists such as Herbie Hancock, The Police, Duran Duran, Lou Reed & Frankie Goes to Hollywood etc, continuing to up his game in solo mode with U2, Frank Sinatra, Paul McCartney, The Beatles & Blur amongst others. KG thrives on re-inventing himself and SPACECAKE, his first book, takes you on an interactive tour of his life via pictures, music, film clips and 27 chapters of abstract insight into how everything from the first hits to WholeWorldBand, his music/video collaboration app, got made. It’s dark in some of the corners though...so make sure you bring a torch. Both Godley and Lol Creme briefly “reunited” with their former 10cc bandmates Eric Stewart and Graham Gouldman on the 1992 album, “Meanwhile”. However, Godley claims that their involvement with the project was very limited, as the album was dominated by studio musicians. He performed the lead vocal on “The Stars Didn't Show”, the band's tribute to the late Roy Orbison. It was the only song on the album not sung by Stewart. Following “Meanwhile”, Godley and Creme went their separate ways. It’s been brought to our attention that www.10ccworld.com, the official website of the 10cc touring band, has a shopping page where you can purchase various items… t-shirts, tour programmes, CD’s and mugs. This coming July 17th 10cc will be performing in Leeds at the Millennium Square. Click on the link to find out ticket prices and availability. Don’t forget that they are also playing three gigs at the end of May, the third of which is at the Royal Albert Hall, London. Southend and Crawley being the other two. And now we’ve news of another festival gig… click here for details. 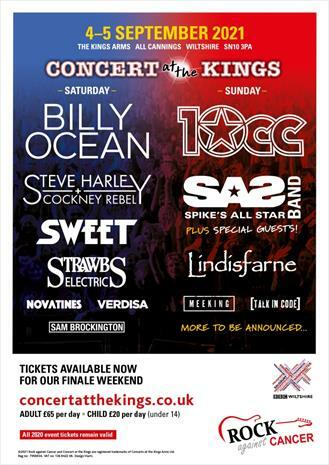 Hardwick Live 2015 will have James as the headlining act, joined for the one-day festival by 10cc, Embrace and Razorlight. I thought you might like to know that we are running a promotion to celebrate the current 10cc tour for anyone purchasing prints from our catalogue (of ten album cover limited editions). For the first 10 purchasers of a single print we are including a copy of a booklet designed by Storm Thorgerson which has been signed by Graham Gouldman. For anyone buying two or more prints we are including a copy of Aubrey Powell’s new ‘Hipgnosis Portraits’ book which features 10cc of course. Torquay United AFC is very pleased to announce the launch of Yellowfest, its first music concert inside the Launa Windows Stadium, Plainmoor, Torquay on Saturday, 9th May 2015. Headlining will be the legendary 10cc plus the magnificent Glenn Tilbrook and Chris Difford (Squeeze) and local bands These Reigning Days, Three Bags Full, The Simmertones, Tesserae and The Esplanades. The e-book is in its final editorial stages but Eric doesn't know when it will be published. The ES compilation album will be released by Cherry Red and feature a variety of tracks from Frooty Rooties, Girls, Do Not Bend and Viva La Difference. Some tracks will be remixed. There is currently a problem with the licensing of two tracks and this has held up everything else so there's no planned release date yet. 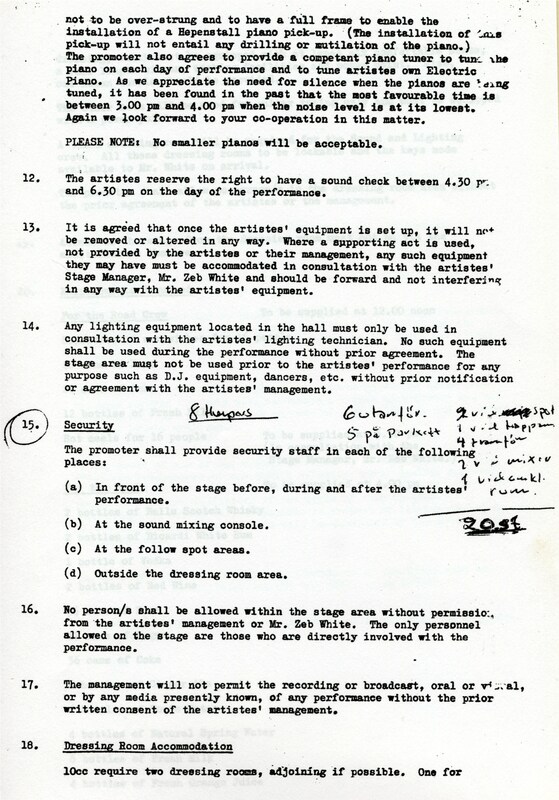 And in case anyone was wondering, Eric will NOT be appearing with Lol Creme and Trevor Horn on March 5th. The soundtrack album for the movie Animalympics can now be downloaded from iTunes. …Lol Creme takes to the stage alongside Trevor Horn in a concert at the O2Empire, Shepherd’s Bush, London in early March. The concerts in Ipswich (Oct 13), Watford (Oct 14), Crawley (Nov 3) and Reading (Nov 4) were postponed on the recent tour but have now been reallocated new dates. Ipswich will be February 18th 2015 and Watford is February 23rd. Reading gets a February 5th gig and Crawley May 26th. New dates at Canterbury – February 6th and Southend May 25th have also been added to the tour along with London Royal Albert Hall on May 28th. 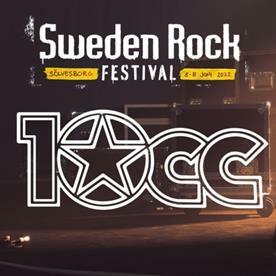 After the exceptional success of their festival shows in 2014, which included the 65,000-capacity British Summer Time in Hyde Park and a 23-date provincial theatre tour through October-November, the legendary 10cc are back in 2015 with 17 major concerts and a return to London’s 5,200-capacity Royal Albert Hall. What is set to be a unique series of performances, the band will be celebrating the 40th anniversary of their highly acclaimed album Sheet Music,- including Top 10 hits The Wall Street Shuffle and Silly Love – which the band will perform in its entirety as the first half of a two-performance concert, with a special video contribution from 10cc co-founder Kevin Godley. The second half of the evening will feature the usual 10cc classics, including Dreadlock Holiday, Rubber Bullets, I’m Not In Love, The Dean and I’m Mandy, Fly Me. making these shows a must-see for old and new fans alike. The Jewish Community Centre in London is hosting an event on December 10th. Nicky Chinn, Don Black and Graham Gouldman will be sharing their anecdotes about life in the music biz and answering questions from the audience. Leslie Anne, wife of the late Andrew Gold, recently came across a demo of Wax’s “Don’t Play That Song”. The final version that appeared on the album “A Hundred Thousand In Fresh Notes” can be heard here. Kevin Godley’s WholeWorldBand the big winner at Eircom Spider Awards, picking up three awards including the Grand Prix Award. As well as scooping an award for Best App and Innovative Use of Technology in Digital Marketing, WholeWorldBand (WWB) was also named the Grand Prix winner at the 2014 eircom Spider Awards in The Convention Centre this month. The awards, the longest standing and most prestigious digital awards in Ireland, reward Irish businesses and community organisations for digital excellence. Based in Dublin, WholeWorldBand (WWB) is a free iPhone and iPad app that allows anyone to easily make music and videos that can be shared and enjoyed worldwide. The app already has users ranging from music industry heavyweights such as Ronnie Wood (The Rolling Stones), Stewart Copeland (The Police), Phil Manzanera (Roxy Music), Dave Stewart (Eurythmics), and New Model Army, as well as thousands of beginners and up-and-coming musicians collaborating together. The app was launched at the end of 2013 and is now live in over 100 countries on the Apple App Store (an addressable global market of US$5.9 billion). The fan club website will of course bring you reviews as soon as we can too. At Radio 2’s “Festival in a Day” concert at Hyde Park on September 14, Jeff Lynne performed with former members of ELO (well, only keyboardist Richard Tandy; at least they got him) for the first time in 28 years, performing a number of songs in 75 minutes for an ecstatic crowd of 50,000 people. By all accounts, Chris Evans of Radio 2’s Breakfast Show somehow convinced him to take to the stage and perform with former keyboardist Richard Tandy and the BBC Concert Orchestra. The touring 10cc’s Mike Stevens and Mick Wilson performed on-stage in the line-up. After singing “All Over the World,” Lynne gave two thumbs up at the crowd saying, “Wow, fantastic. It’s unbelievable this really. I haven’t done anything like this for so long, I can’t believe it.” He then proceeded with ‘Evil Woman’, ‘Ma Ma Ma Belle’, ‘Showdown’, ‘Living Thing’, and ‘Strange Magic.’ After this, he introduced “10538 Overture” with the words “Here’s one you might know. Have a listen.” The audience did not know, but they enjoyed it anyway. From the songhall.org website: "Graham Gouldman is one of England’s most successful songwriters, penning such classic 1960s hits as “For Your Love” and “Heart Full of Soul” for The Yardbirds, “Bus Stop” and “Look Through Any Window” for The Hollies, and “No Milk Today” and “Listen People” for Herman’s Hermits, while also writing hits for Jeff Beck, Cher and the Shadows. On behalf of all Graham Gouldman and 10cc fans everywhere, we offer our sincere congratulations to Graham for this monumentous recognition of his songwriting. 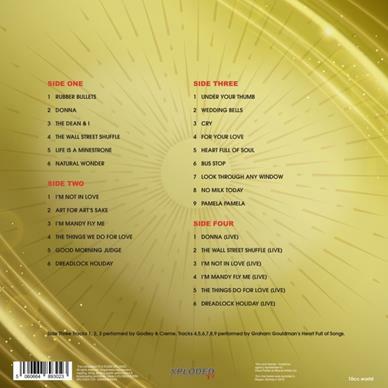 Here are a set of photos showing you the new “live” CD from Graham Gouldman. It’s his “Heart Full Of Songs” concert with which the four of them toured the UK last year. On sale at the current UK tour of Heart Full Of Songs Tour. Click the dates link for tour details. Please do not ask us for copies of this or any other CD’s and DVD’s. We do not have any to sell. We received the dates for 10cc’s tour of the UK. It’s part 1 at the moment because there’ll be more dates for February 2015 coming in the next few months. Click on the dates link to see where and when they’re playing. 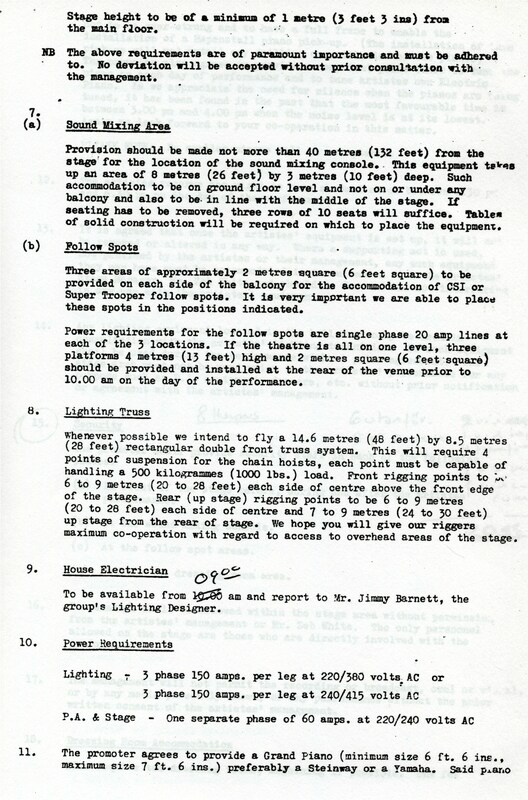 We recently received some very interesting files from Gina Crosby. We thought you might like to see them too. 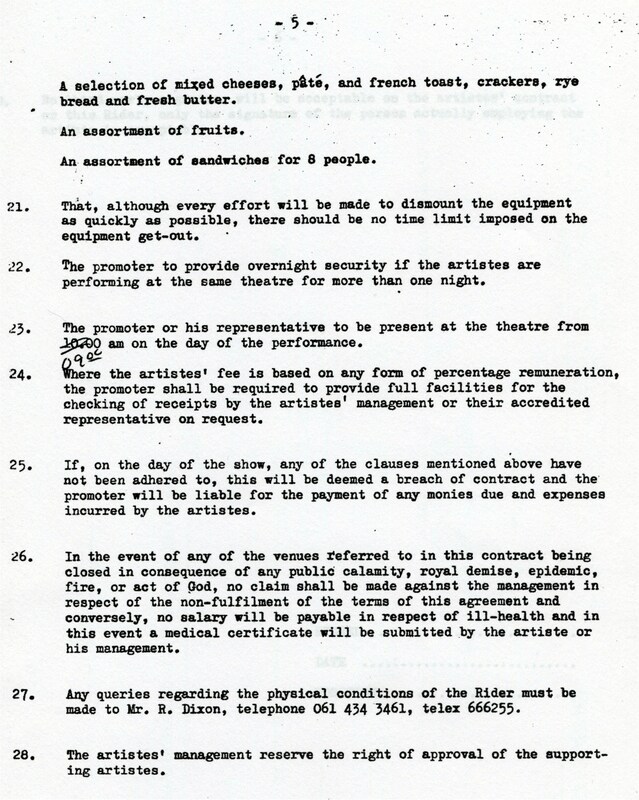 As you can see, it’s the “contract rider” for the 1980 tour. 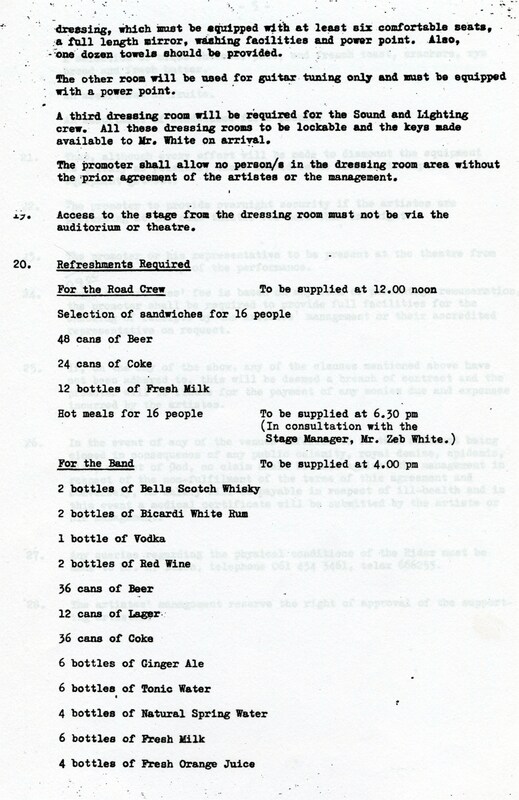 Page 4 has an interesting supply list, don’t you think? We’ll be bringing you more of Gina’s clippings and files in the near future. Congratulations to all of you on behalf of the staff here at the website and everyone at Wienerworld who donated the prizes. You should each be getting your CD in the next week or so. We’ve just received the list of dates for this year’s Heart Full Of Songs tour. It’s the enduring popularity of these tracks and Graham’s love of playing songs in their simplest form, acoustically, that led him and fellow 10cc members into performing some of them – just with vocals and acoustic guitars – as the supporting act at 10cc concerts. 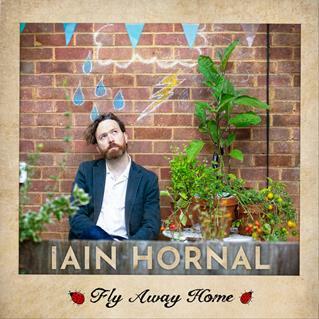 It grew to become a stand-alone entity and Heart Full of Songs debuted in its own right in April 2013, playing 17 shows with several sell-outs, including London’s 800-capacity Union Chapel. Heart Full of Songs performances feature many of the tracks mentioned above, along with Bridge To Your Heart (from Graham’s time in Wax with the late Andrew Gold), other Gouldman compositions and material from his acclaimed latest solo album Love And Work. With 10cc having toured UK arenas with Status Quo last December and their next solo concert tour not scheduled until the autumn, Graham is taking Heart Full of Songs on tour again in May, this time as a three-piece with Mike Stevens and Iain Hornal, with percussion contributions from Dave Cobby. A Heart Full of Songs concert is truly a night to remember. Click on the dates link to see where and when they’re playing. As we said recently, Wienerworld are releasing Clever Clogs on CD this week. We have three signed copies to give away in a really easy competition. All we want you to do is answer a simple two-part question. A) How many UK Number 1’s did 10cc have? Email your answers along with your name and address to ‘competition@the10ccfanclub.com’ by March 24th. Please, just one entry per person. The winners will be picked shortly after the closing date and the staff at the fan club website will get the CD’s out as fast as we can. WIENERWORLD got in touch with us today. On March 10th they will be issuing a CD version of the Clever Clogs concert recorded live at London’s Shepherds Bush Empire in March 2007. This 17 track CD is packed with 10cc’s top 10 hits featuring 3 number one's including I'm Not In Love, Rubber Bullets and Dreadlock Holiday. Along with the 10cc material, Graham Gouldman and the band perform hits he wrote for The Yardbirds, The Hollies and Herman's Hermits. This concert features original members Graham Gouldman and Kevin Godley along with top musicians Rick Fenn, Mick Wilson, Mike Stevens and Paul Burgess. 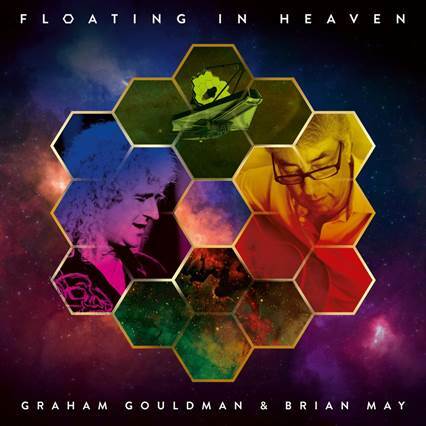 We will be running a competition soon, in conjunction with Wienerworld, to win copies of the CD signed by Graham. Eric was a special guest of The Producers at the recent MPG awards ceremony. Trevor Horn received a lifetime award. It went very well indeed. It was the first time Eric and Lol have been on stage together in quite some time!. We received a link today to a review of a festival 10cc appeared at recently in New Zealand. It starts off with “Three bands from the past convened at Matakana’s Country Park on a blistering hot Sunday afternoon. Other than the fact that they are all “vintage” acts, they had little in common musically with each other. Not that the crowd cared…they just wanted to party.” Click here to read the whole article. Eric Stewart reached the ripe old age of 69 on the 20th, best wishes from your fans everywhere. Francis Coates wrote to us this week. He was the band's stage lighting designer in the 70s, and made the mirror-ball clad motorised 10CC stage logo used on all their live dates at that time, and re-made last year for their UK tour. Last used by the band for their Manchester gig in 2013. He is now offering this fully functioning Logo in it's road-box for sale as he no longer has room to store it. He asked us to pass this information to club members as he would obviously want it to go to someone who is a fan of the group. He added : I have much 10CC memorabilia, inc tour schedules, crew photos, stage lighting plans, newspaper reports on gigs in the UK and abroad, gig programmes etc etc. We’ll try and get photo’s of everything as soon as possible. We're delighted to announce that Graham Gouldman is going to be inducted into the Songwriters hall of fame. The ceremony will take place in New York on June 12th. We just learned this from the 10ccworld website. Graham said "I am very proud to be joining such esteemed company". It’s a fraction under 20 minutes long and actually features the 1980 Look Hear? Tour with the giant tape machine backdrop. "Rewind Scotland – The 80s Festival" in Perth, Scotland is back for its fourth year running. 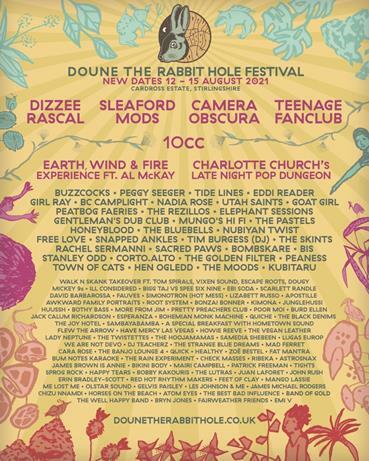 The festival will take place from Friday 18th July until Sunday 20th July at Scone Palace, Perth, Scotland. This year’s headline performances include Billy Ocean, and a rare festival appearance from American pop/soul/R&B icons Daryl Hall and John Oates (their only Scottish Festival appearance this year). As with all past Rewind Festivals, the 80s celebrations will showcase non-stop music on the main stage from the biggest 80s icons, plus plenty of audience participation and dressing up. 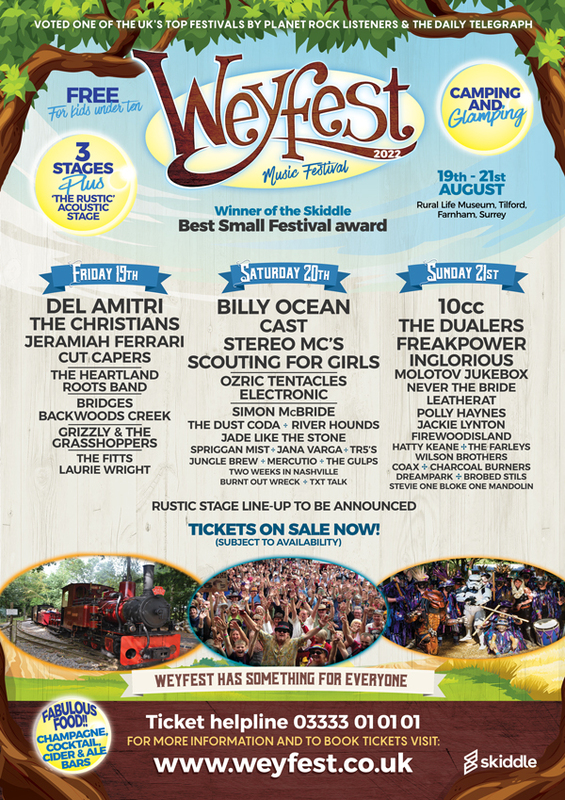 The festival also features more unforgettable 80s artists including ABC, The Sugarhill Gang, 10cc, Midge Ure, Blancmange, Roland Gift, Johnny Hates Jazz, Jimmy Sommerville, The Boomtown Rats, T’Pau, The Selecter, Marc Almond, plus many more. Tickets go on sale at 9am on Friday 31st January. Full details about ticket outlets and prices are available from the official Rewind website - http://www.rewindfestival.com. All articles published for your personal enjoyment only.